Availability: Tuesdays, Thursdays and Fridays. Start Time: Pick-up times will be confirmed once you’ve made your booking. Don’t Miss: The chance to visit the beautiful cathedral at Silves. This exciting tour of the Algarve visits some of the most interesting and historically significant towns in this area. Explore the castle and cathedral of Silves, shop for traditional handicrafts in Monchique, visit the famous Cape St.Vincent and much more on this full day trip. See some of the culturally and historically significant towns in the Algarve. Explore the cathedral and castle at Silves. Visit Cape St. Vincent and the village of Monchique. Explore Lagos, visit the fishing village of Sagres and much more! Tour includes round-trip transfers from the resorts of Praia da Luz, Lagos, Alvor, Praia Rocha, Carvoeiro, Armacao Pera, Praia Gale, Albufeira, Olhos d’agua, Vilamoura, Quarteira, Vale Lobo and Quinta Lago. Rich in culture and steeped in history, don’t miss this opportunity to discover the more historical side of Portugal on this tour of the Algarve! 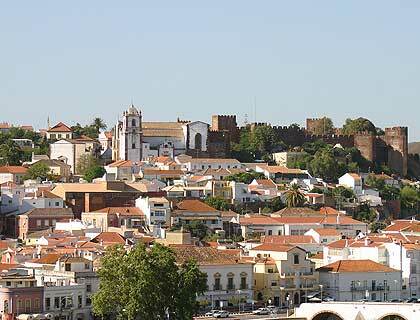 The first stop on this full-day excursion is the town of Silves, to visit the Moorish Castle (entrance fee not included with ticket) and the XIII century Cathedral. The tour continues to the traditional village of Monchique, nestled in the scenic hillsides. You’ll have some free time here to explore the village at your own pace and shop for handicrafts. Next is Lagos, a town that’s linked to the Portuguese Discoveries. Here you’ll take a guided visit of the Antonine Museum, which is located within the Golden Chapel of St.Anthony (entrance fee not included with ticket). While in Lagos you’ll also see the slave market and the statue of Prince Henry the Navigator. The journey continues to the fishing village of Sagres, where you’ll visit the harbour and discover the famous Cape St.Vincent. Sunday, Tuesdays, Thursdays and Fridays. Pick-up times will be confirmed once you’ve made your booking. Pick-up is available from centrally-located hotels in the following resorts: Praia da Luz, Lagos, Alvor, Praia Rocha, Carvoeiro, Armacao Pera, Praia Gale, Albufeira, Olhos d’agua, Vilamoura, Quarteira, Vale Lobo and Quinta Lago. Transport, English-speaking guide and hotel transfers. Entrance fees to some venues are not included with your ticket and may incur an additional charge.